These Cobbles are transparent blue glass with an iridized surface. The iridized surface makes extra shiny and reflective like the surface of oil. 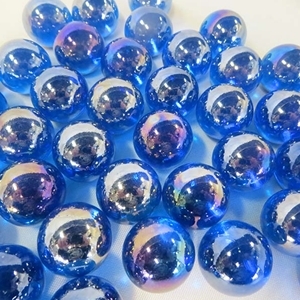 These marbles come in packs of 12 or 100 marbles. They are approximately 22mm or 7/8" in diameter and usually range between 20 - 23mm in diameter.